Cele assured the education of her younger sister, Jade, now a journalist with the local radio station; she protectsTete, her younger brother, attractive, seductive and drugged. As for her elder brother, a driver, she supports him despite her difficulties with her sister in law because she has a mother’s heart for her nephew Lai Jin Duo’er; she has breast-fed him after the death of her own child. To recover the family house, she must first stop fighting with her stepmother and her father so they do not oppose the project and then obtain the support of the head of the housing office by marrying the waitress of her restaurant to his mentally ill son ! In short, a family like so many others. Managing her life is, for Cele, more difficult than selling duck necks. A brief encounter with a customer in love, but a bit hopeless (like almost all the male characters with Li Chi) will improve nothing. A short book, concise, which can be read easily and with pleasure. A novel about Chinese cities, today’s China; realistic of course, but never sordid and without the tone of denunciation. 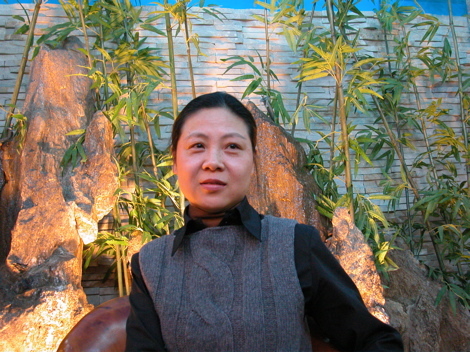 Chi Li has always kept away from possible political risks, although in her work, some weaknesses of the current Chinese society are described as self-evident. In this book, for example, it is the corruption of the administration. She writes in a clear and calm manner, not without humor; a pleasant style but sometimes too allusive that does not give enough depth to her characters. Chi Li is probably afraid of falling into the caricature of the boss, the cook, a strong personality, before her furnace with its kebabs that grill and the wok that fuses! A character is very present: the city of Wuhan, where Li Chi was born, is one of the three major urban areas in China extending its 10 million inhabitants on both banks of the Yangtze River. A film, based on the novel and directed by Huo Jianqi, received a grand prize at the Shanghai Festival in 2002. It has not been presented in Europe but had a good career in China, like the play and the television series inspired by this bestseller. An unassuming writer: This book is the ninth novel by Chi Li translated into French and published by Actes Sud, while not even a line can be found in English. This is the result of the efforts of Isabelle Rabut, Professor at the Inalco and of several translators. Chi Li is an unassuming author who rarely travels, who stays away from the “literary circles”. She grew up in a family which was a complete break with the traditions of ancient China. Like millions of young Chinese, she was sent to the countryside as “educated youth”, then became a teacher. She later studied medicine and practiced for five years. Studying literature will enable her to become editor in a literary journal and start writing. She is now vice-president of the Writers Union of Wuhan. Her book had some unexpected consequences: the duck necks have become with the dry and warm noodles, a specialty of Wuhan known throughout China ! ► “Le Show de la vie” by Chi Li – translated by Hervé Denès – Actes Sud, 2011, 170 pages, 18 euros.